The earliest hand tools date back to the Old Stone Age (of the Paleolithic period), the earliest period of human development, which started roughly two million years ago. These early hand tools included sticks and rocks picked up and used to pound, dig, or throw. Modern technologies make hand tools that are battery powered, so they are still portable yet easier to use than their predecessors. Technology begins in human history when the first stone flints or spear tips were deliberately cut. These are known as Oldowan tools or eoliths. It is often difficult for archaeologists to prove that the sharpened edges of some stone artifacts are human-made rather than the result of naturally occurring processes. However, certain improvised tools such as pebbles and animal bones show clear signs of the wear and tear of use. Other tools that have been found with human remains in areas that archaeologists have defined as settlements are clearly human-made. About one-and-a-half-million years ago, an improvement was made upon the basic carved tool. The newer tools fall into three categories: hand axes, picks, and cleavers. Hand axes from this period are flaked on both sides and often shaped carefully into teardrops. Picks are long tools, with either one sharp edge or two. Cleavers are smoothed into U-shapes with a sharp point on one side. Archaeologists have a long list of possible uses for these artifacts, which may have served more than one purpose. Butchering animals, digging for roots or water sources, and making other tools are the most common suggestions. The Bronze Age, which began about 3500 B.C. , is the period in human history when metals were first used regularly in the creation of tools and weapons. Metal alloys like bronze were deliberately crafted to improve the durability and efficiency of hand tools. Handcrafted knives were important for nomadic (wandering) peoples who hunted to survive. Swords became crucial tools in warfare. The invention of the metal plow brought agriculture a huge step forward, since it made systematic planting over wide areas possible. Some hand tools have gone out of style or are used only rarely. The cobbler (old term for shoemaker) used to make shoes by hand, but now people buy mass-produced shoes and only take them to a repair shop to be worked on by hand. However, a sewing needle has not changed in centuries—it is still a common household object. Even though people now have access to big sewing machines, it is still easier to fix a button or darn a small tear with a plain needle. During colonial times only the metal parts of a tool would be sold to a user, who would then make his own handle out of wood to fit in his hand perfectly. Many things made with metal nowadays, like nails and shovels, were then made from wood. This is why older buildings and tools have aged well, without problems such as rusting. 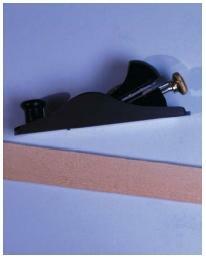 Simple hand tools, which cut, pound, or assemble, are now sold with attached metal or plastic handles. Their basic designs and operations, however, have not changed over time. Drills are still used to bore holes, saws to cut hard materials, screwdrivers to attach screws, wrenches to tighten nuts and bolts, and planes and files to smooth down metal or wood surfaces. Some of these tools, such as drills and saws, are now primarily electric, which saves time and effort. Other present-day tools combine modern technology with time-tested operation. Squares and levels now measure inclines and angles with liquid crystal digital displays, but they otherwise look, feel, and perform like their old-fashioned counterparts.